The debate rages on about AirBnB versus some hotel industry trade associations and city governments. A lot of innkeepers and hoteliers we talk to continue to resent AirBnB. That’s understood. 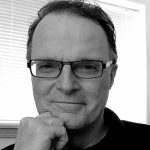 But it still looks like this “disruptive” technology play is here to stay, so what can we learn when we take a look at the big picture? Are there opportunities for smart, progressive BnB owners? Look at the pure density of rooms and homes being rented out in the emerald city. 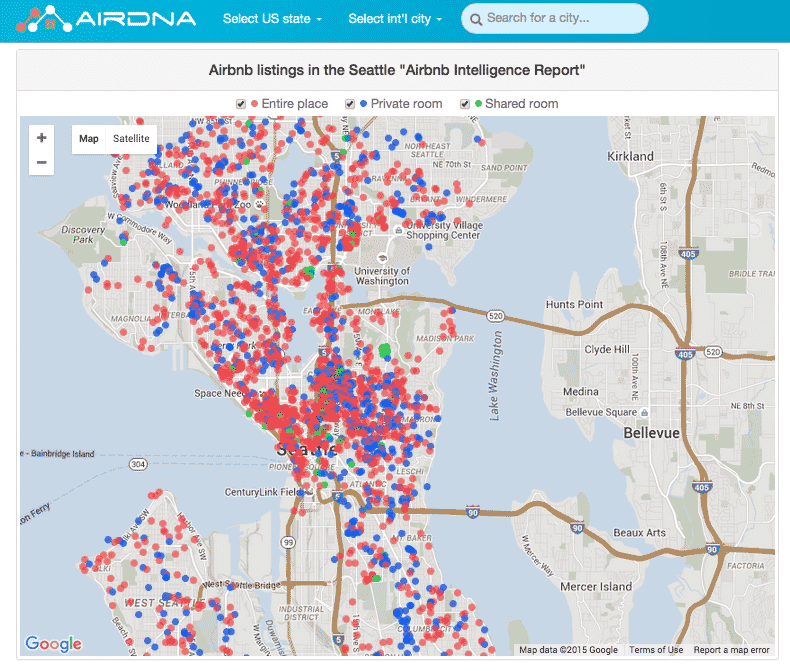 AirDNA produces this map and counts 3200+ AirBnB properties available in Sept. 2015 for Seattle, WA. What can we make from this AirDNA map of AirBnB residences available in Seattle this month? There are about the same number of private rooms (blue dots) to entire residence (red dots) options, with a concentration of “entire residence” availability in the downtown waterfront area. When you hover over the dots, you can see that most of the red dots show as an “apartment”. 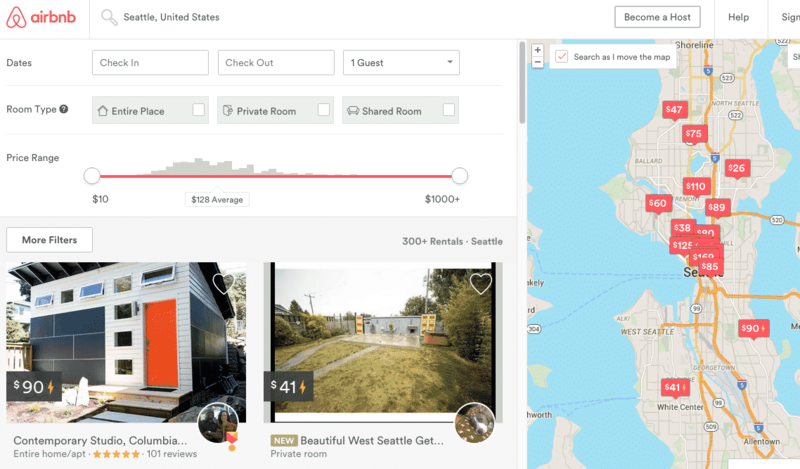 This map shows listings when you search for “Seattle” on AirBnB. AirBnB chooses to show a lot less properties, initially, on its map than was found by the data for the airDNA map above. A chart shows the average room rate at $128 (above left). PAII has published numbers showing an average daily rate for BnBs at $150 — no doubt low for Seattle. We’re review that under the next map below. When you switch to only viewing “private rooms”, the rates switch to a range from $49 – $89. Reviews start playing a roll… is this why there are less properties showing on the map? The photos show an interesting small studio apartment (bottom left) that could be installed on some BnB properties (check your city zoning codes and licensing details). Most properties listed require a minimum 2-night stay. There are less properties shown on this map — a lot less — than the first airDNA map purporting to show all available listings for AirBnB in Seattle during this same month. Why? I’m not sure, but it is know that, like other OTAs, AirBnB rewards certain properties based on reviews, performance, and longevity with the service. 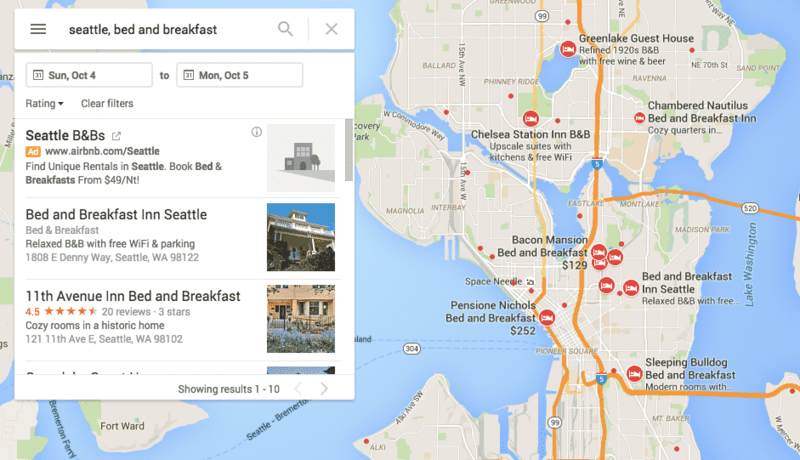 A Google map search for BnB’s in Seattle turn up relatively few properties. The obvious observation? There are far, far fewer BnBs. Why is that if demand for rooms is shown to be very robust? Apples to Oranges? Maybe. We continue to note that reviews on Google+ still play a factor in both the SEO for listings, and as yet another place prospective guests will learn about your property. Average price per room was $195 (we reviewed 6 properties), with a low of $129 and a high of $254. We counted approx. 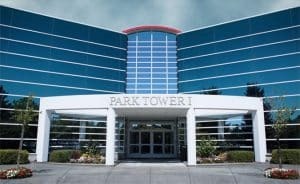 30-40 BnB properties in the Seattle area we are reviewing. With an average of 6 rooms, this equals something like around 200, give or take 20 or so, BnB rooms available in an area where AirBnB is listing 3200+. At 40% occupancy rate, that would be an additional demand for about 1280 rooms on any given day. Look into adding a small studio mini-house on your property. If you could expect $95 a night for at 45% occupancy, that would add around $15k per year gross to your cash flow. Think of the “billboard effect”. Each time someone sees you on AirBnB (and thousands will) it represents another new opportunity for new visitors to learn about your property. 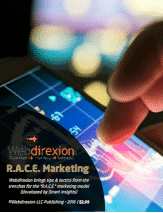 Plus, studies have shown that a majority of those shopping at OTAs will then go to your website and book direct. What if a portion of your property (say 2-4 rooms) were to “switch over” during traditional off-season periods to a no-frills local room rental service? It’s a different business model to be sure, so you would have to be very clear about it both in your marketing materials, and also in the property itself. Seems like this option would require some careful planning to segregate the types of guests. Now to handle the last problem whether you’re considering AirBnB vs. BnBs in Seattle or elsewhere. How do you efficiently manage room inventory? We continue to advocate and prefer the simple myallocator system that is integrated into Checkfront online booking for managing OTA room inventory so you don’t double-book. While Checkfront is our preferred cloud booking solution for a lot of reasons and we have a marketing agreement with them, we can and do work with other systems. Download a comparison of CheckFront to other cloud booking options (PDF). We know it’s tough to wear all the hats of an innkeeper and deal with all the technologies — contact us, and we’ll help you set it and forget it.